[OFFICIAL] DearMob iPhone Manager - Backup, Restore, Transfer and Manage All iOS Files. iPhone XS giveaway has ended on Apr. 8, 2019 at 11:59pm PST, the lucky winner is annouced at this page. DearMob iPhone Manager An easy iOS manager to transfer your iPhone data with encryption method. Backup & restore iPhone iPad offline, selectively transfer & manage any iOS file. Make your iOS devices simply mastered on computer, deliver the power, simplicity and security that iPhone users need. Without iTunes. Backup & restore iPhone iPad, transfer & manage photo, music, contact, SMS, etc., sync all changes in 1 click. Let you easily free up iDevice space or switch to new iPhone, deliver you the power, simplicity and security. Outsmart iTunes. Fast speed, even large files take only seconds. Say "No" to iTunes/iCloud backup limits, get all jobs done. Easily organize your contacts, keep it safe. - Export contact to computer as VCF/PDF/TXT/HTM. Quick print enabled. - Import, add, modify, delete selected contact in no time. - Sync to computer "Contacts", selectively merge duplicated copies. A ready-to-use solution to keep control over your podcast/iTunes U. - Download podcast/iTunes U from your iOS device to computer at will. - Add new podcast to iPhone iPad for enjoyment. - Send new courses or lecture from local computer to iPhone. Guarantee your data 100% reliable security. - Protect your personal photo, video with password. - Decrypt the encrypted file with correct password only. A all-in-one book manager and converter. - Manage your book collections of ePub, PDF, and audiobook. - Convert ePub to PDF, TXT, HTML for Kindle compatibility. An easy-to-operate method for Voice Memo backup. - Much simpler than iTunes to get Voice Memos off iPhone to computer. - Delete unwanted Voice Memos at ease. Create, customize, manage ringtone in a single portal. - Directly make ringtone with music from iPhone. - Convert mp3 to iPhone ringtone with a wave form. - Put customized ringtone to iPhone, delete ringtone without iTunes. You deserve to take control over all your App & App files. - Get Apps that are not in App Store. No Jailbreak required. 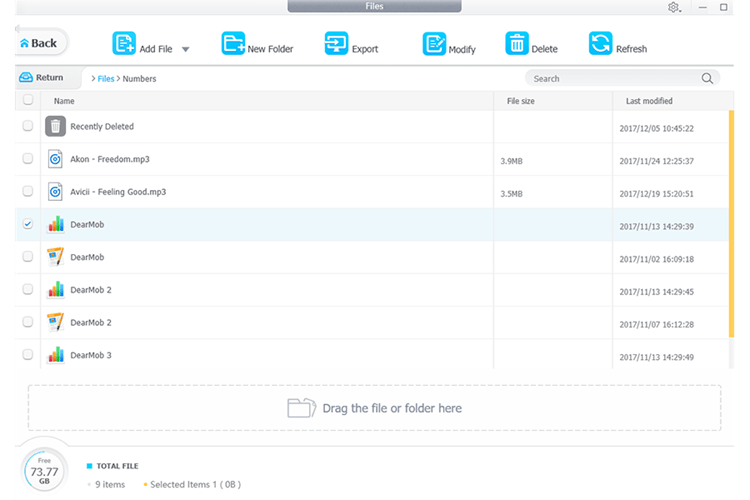 - Manage App files, get video out of App, delete unwanted files, etc. Establish a simple and safe SMS management. - Backup your SMS, iMessage to computer with no data loss. - Save or open pictures in SMS onto your computer. Offer all you need to manage your iPhone calendar. - Arrange calendar by all, repeat daily/weekly/monthly/yearly clearly. - An easy way to do all the things, export, import, add, edit, delete. Mount your iPhone as an secret USB totally for free. - Store any kind of file like Word, Page, PDF, PPT, music, folder, etc. - Options to create new folder, export, modify, delete. High speed. Load, preview, sync photos in a matter of seconds. - Download HEIC pictures as JPG from iPhone to computer. - Without iTunes/iCloud. Transfer photos between computer and iDevice. - View photo in group, create & edit album, delete photo/album. 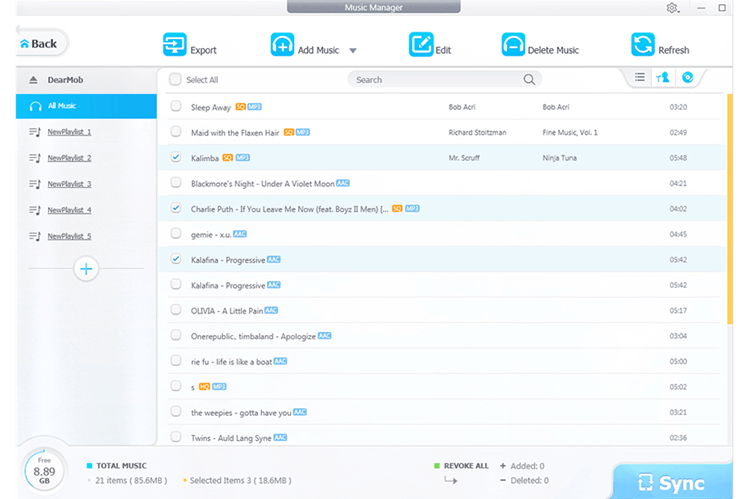 Simplify the complex iOS music backup without data loss. - Utterly fast to transfer music. Add non-iTunes music to iPhone. - Flexibly add/edit/delete playlist & songs. Play music in iPhone or computer. - Intelligence provided in converting Apple unsupported format to MP3. Transfer 4K videos from iPhone to computer to free iPhone storage. - Flexibly backup videos by one or in batch. - Add & convert any video (MKV, FLV, etc.) to iPhone. - Options to compress large videos to iPhone with no quality loss. Backup & restore iOS data. 100% secure, totally easy, entirely reliable. - One click to backup your Apple device without iTunes iCloud limit. - Restore your backup from local computer at any time. - Safety-first, encrypt your backup with password. iOS 12 compatible. Ultimate choice to manage your office files. - Share files (ie. Pages, Numbers, Word) between iDevice & computer. - Add new folder, classify, modify, delete files at will. DearMob iPhone Manager, the peerless tool to transfer photos between iPhone iPad and computer, now stands 100% ready to manage photos in albums like Camera Roll, Selfies, Live Photo, Panoramas, Instagram, Snapchat, etc. Import & Export Photos1-click transfer photos irrespective of the sources. 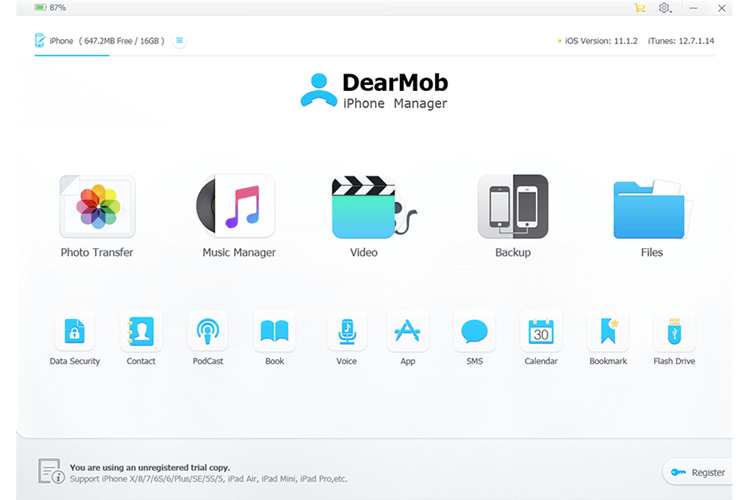 DearMob iPhone Manager, a simple and safe solution to make music transfer between iPhone iPad iPod and PC/Mac in a cushier way without iTunes. Two-way sync at super fast speed. Import non-iTunes music to iPhone. Export/add/edit/delete playlist, song. Manage music without quality loss. Auto convert Apple unfriendly OGG, FLAC, WMA, WAV, etc. to MP3/AAC. Create ringtone with iPhone music. Transfer ringtones without iTunes. DearMob iPhone Manager allows you to transfer videos to iPhone iPad for offline enjoyment, never make your Video App useless. Unique! Transfer/convert 8K videos. Delete recorded videos on Mac. Auto rotate video 90 degrees for full screen playback on iPhone iPad. Recognize video by codec, convert iPhone iPad unsupported video. Export 4K videos to free up space. Compress large videos up to 50%. iPhone/iPad is one of your most important possessions, so is the iOS data. The best way to treasure your data is to backup it up. DearMob iPhone Manager provides with a safe and simple way to backup & restore whole iDevice data, enabling you easily switch to new iPhone iPad. 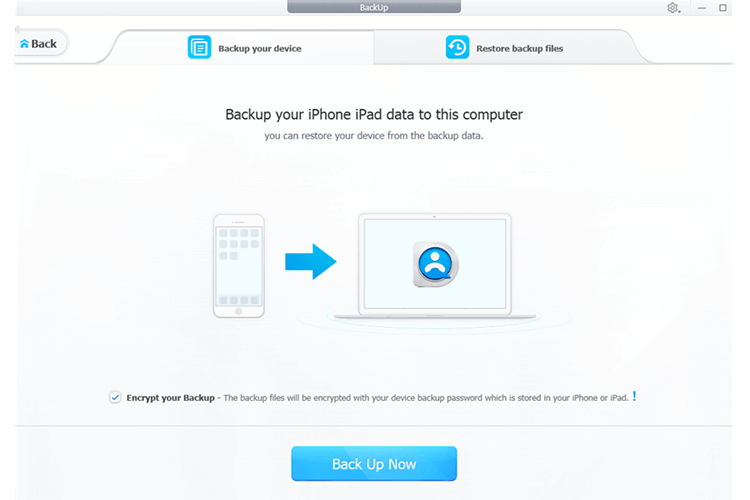 Backup all your iPhone iPad data on Mac or Windows, in case your device is stolen, lost, damaged, etc. Restore your backup copies to iPhone iPad in only one click, easily switch to a new iOS device. Encrypt your backup with password by DearMob iPhone Manager. Only with the correct password, can you restore it. Your data is very valuable, which is why DearMob iPhone Manager builds the military-grade data encryption to secure it and avoid privacy leakage. ● Adopt 256-bit AES, 1024-bit RSA, PBKDF2, Argon2 encryption tech. 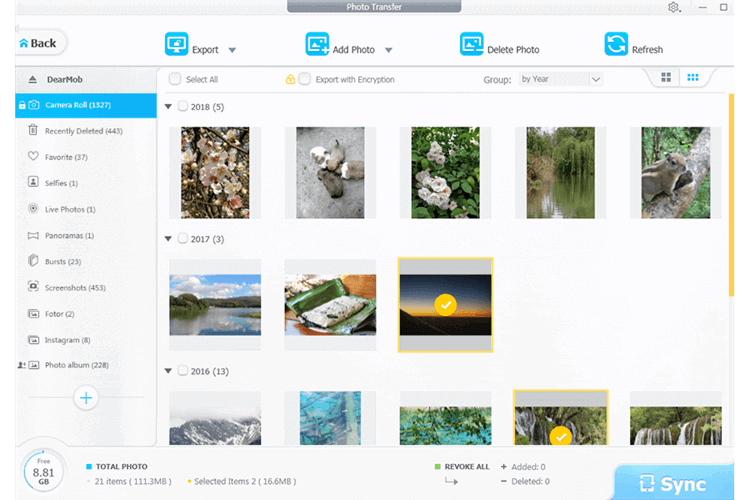 ● Fast speed: encrypt 100 pieces of 4K photos in only 20s. ● Add an additional layer of security to your data with password. ● The only way to open the file is to decrypt it with correct password. Newly added iPhone contacts cannot be stored on SIM card, if you change an iPhone, you need to transfer them to the new iPhone. DearMob iPhone Manager helps you nail it in a simple way. ● Backup your contacts and restore to any iPhone/iPad/iPod. ● Flexibly merge duplicated contacts in one click. ● Export contacts as VCF/PDF/TXT/HTML. Offer you a quick print option. ● Add, edit, delete contact. Sync all contacts to Windows/Mac computer. Some text messages & iMessages carry valuable memories, and some are the important proof in a depute. It's better to backup your SMS, with DearMob iPhone Manager. ● Selectively backup text messages and iMessages. ● Export SMS as PDF for you to view and print on computer. ● Store pictures, videos and audios in SMS to PC/Mac. Through DearMob iPhone Manager, you can manage all your private or work events with enough flexibility. Get your important dates well arranged. ● Group calendar by all, repeat daily/weekly/monthly/yearly. ● Import/export calendar between computer and iPhone. ● Add new calendar, edit, delete calendar at ease. Importing Apple Books from PC/Mac to iPhone iPad is possible by iTunes. Exporting? Not possible. Here DearMob iPhone Manager is geared to transfer and manage all your book collections. ● Cover ePub, PDF, Audio books management. ● Export & convert ePub to PDF/TXT/HTML for wider reading. ● Intelligently grab and preview the book cover. Manage Pages, Numbers, KeyNotes, GarageBand, etc. on iOS 11 & later. Let you install Apps that are not in App Store without jailbreak. Mount your iPhone as an USB Flash Drive. Store anything, share freely. Connect Chrome, Edge, Mozilla and any browser with your iPhone Safari. Why Choose DearMob iPhone Manager? Cover basic photo, music, video, contact, app management. Extend with advanced media format conversion and more features. No complex configuration, manage iPhone files instantly. A clearly arranged interface allows you to transfer files by category. Manage files offline on trusted computer, no worry about private data collecting & leakage. Encrypt your backup data with password. "Designed to be simple to use while still being a powerful tool"
"An all-in-one solution for managing content on your iPhone from your Mac." "A straightforward utility for managing your iDevice more efficiently." "Keep iOS easy with DearMob iPhone Manager"
"An outstanding tool with really good features." "Offers a range of additional tools that you don't get with Apple's offerings"
Follow us to get the latest product upgrade, discount event and tips. 5KPlayer, more than a UHD player, is a new-style media player to play, stream and download video music. iPhone Data Backup and Transfer via DearMob iPhone ManagerLearn how to use DearMob iPhone Manager to manage, backup and transfer data on iPhone iPad. Backup Transfer Video Music Photos with DearMob iPhone ManagerMake good use of it to transfer iPhone music, backup iPhone photos, import movies, ebooks etc. Transfer Old iPhone to New iPhone Guide: DearMob iPhone ManagerThe best tool to transfer old iPhone to new iPhone without hassle. Backup and Restore iPhone Data to Computer without iTunesThe easiest way to backup any iOS file to computer without iTunes before upgrade to iOS 12. Tips and Guide on iPhone Backup & Restore before Upgrading to iOS 12Find the tips, guides, error solutions to iPhone backup & restore for iOS 12 upgrading. Selectively Backup iPhone Data via DearMob iPhone ManagerHow to selectively backup iPhone photo, music, video, contacts, SMS and more.